We're doing the happy dance as we celebrate our 200th Challenge! Join us as we celebrate this milestone with a very special BLOG HOP and CELEBRATION CHALLENGE where we give you the gift of FREE digital stamps! Hop through the blogs of our Design Team for a chance to win the digital stamp that they used on their project! In order to win, you must leave a comment & your e-mail on their blog posts. ONE friend will be randomly chosen from every DT Member to win the digital stamp that the DT Member used on her project! Create a card or project that spotlights a celebration...could be birthday, anniversary, graduation, any celebration! 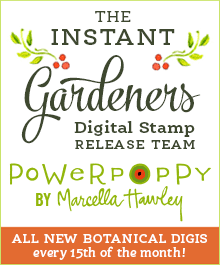 THREE friends will be randomly chosen to win TWO digital stamps of your choice. 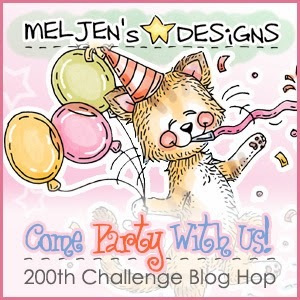 Please remember that you must use a MelJen's Designs digital stamp to participate. 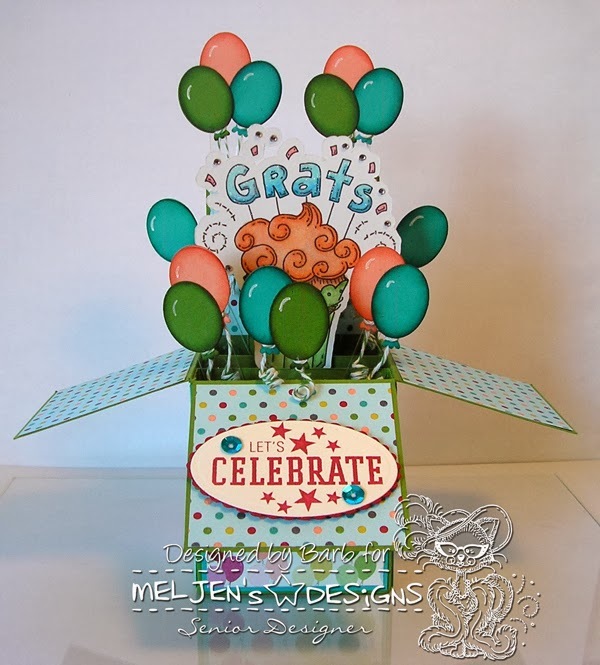 Entries that do not use a MelJen's Designs digital stamp will be deleted before the random draw. 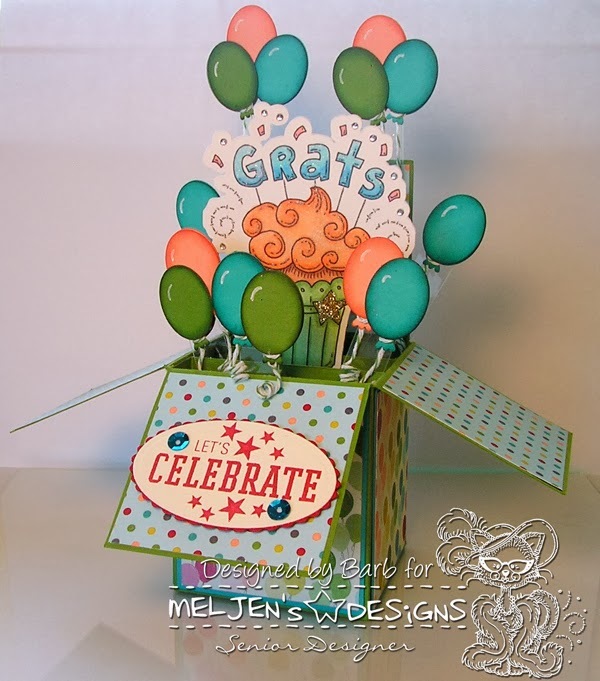 I chose to create a card in a box, using the absolutely adorable GRATS Cupcake digital stamp. This was so fun to make! I printed the digital stamp onto white card stock and die cut it with my Silhouette Cameo. Then I colored it up with Copic markers. Then as usual, I went nuts with the blingy bling! I added crystal glitter to the letters, gold glitter on the little star, clear Wink of Stella to the frosting, glitter pen to all the lines and swirls and finished off the image with lots of bitty gems. 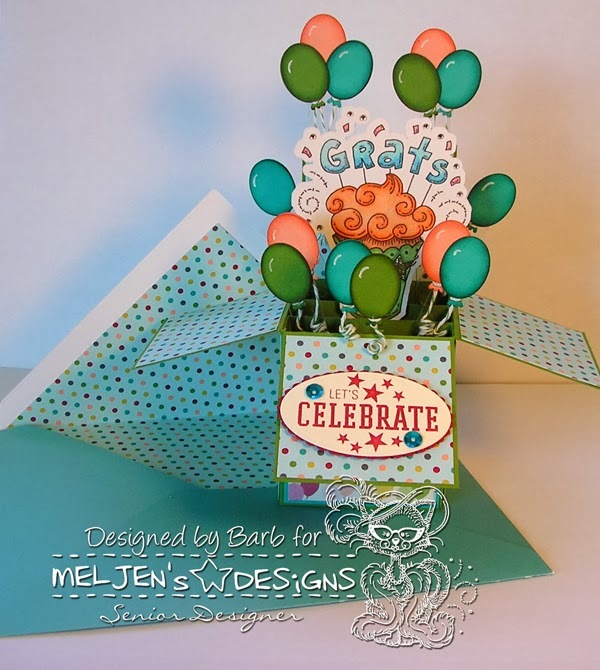 To create the balloons, I used an oval Nestabilities die. And for the balloon knot, I used the feet of the owl from a Stampin' Up! Owl punch. I sponged the pieces using their coordinating inks and I used a white gel pen to create a highlight, then tied on a bit of baker's twine. Next, I adhered all of the card elements to pieces of acetate and then adhered them onto the box. Here is how it looks from the back. I added more sponged balloons, so the backside would look nice also and I left plenty of room for writing a message. The card folds flat for mailing, but because it is an awkward size, I had to create an envelope for it using my envelope punch board. It really does fit inside the envelope! The finished card measures 7 1/2 x 6 1/4 when folded flat. 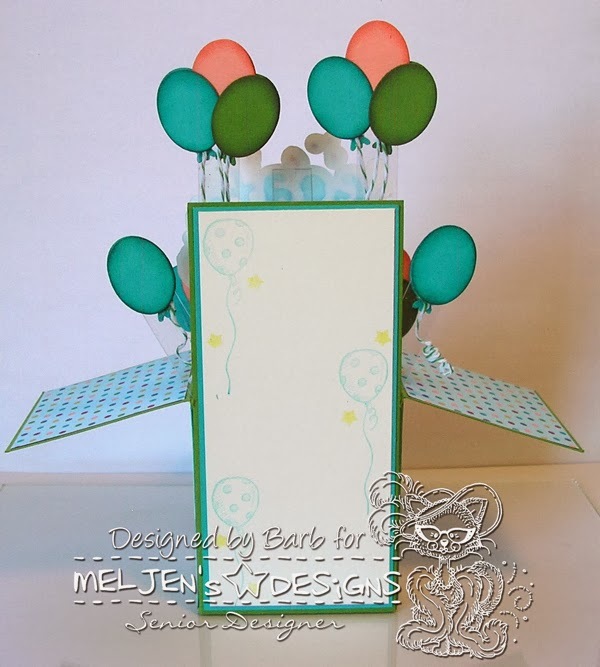 There are many tutorials on YouTube that demonstrate how to create a smaller version of the card in a box. And many of them fit into a standard sized envelope. Those are fun to make, as well, I just wanted something BIGGER for this special occasion! So that's it from me. Don't forget to leave a comment, along with your e-mail address so we know how to contact you if you win the GRATS Cupcake digi! Best of luck to you all! Thank you so much for hopping with us today. Your next stop on the Hop is with the very lovely and talented Celine. Enjoy! 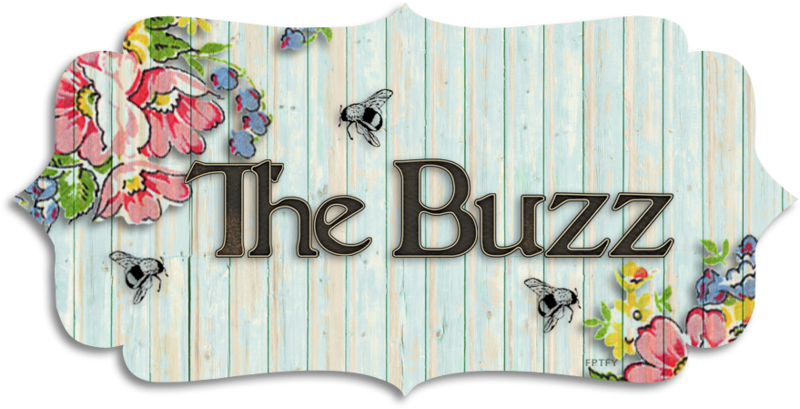 If you get lost along the way or need to take a break, click HERE to go to the MelJen's DT Blog for the master blog hop list. Love, love, love this card, Barb! It's so fun and festive. 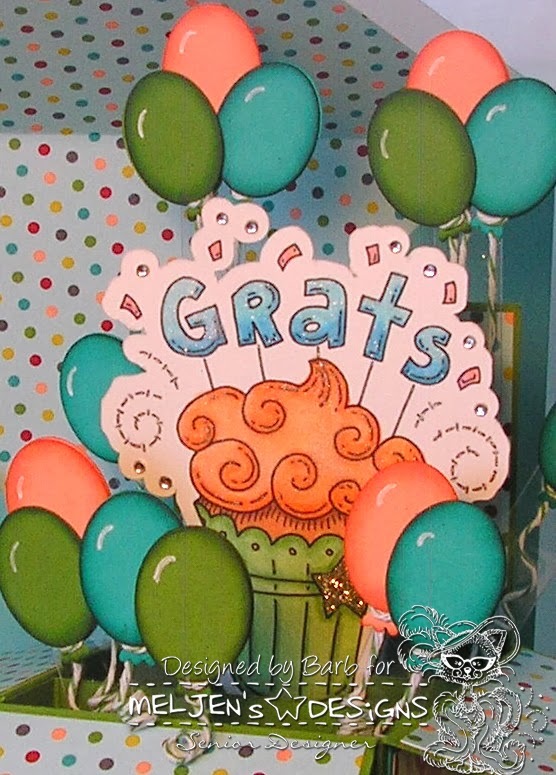 Love the idea of using acetate to hold up those great balloons. And how you curled the twine, too. The bigger size is fun, as is the great color palette. Awesome job! soooo pretty! totally perfect for the celebration! Oh my gosh, I LOVE this. I have seen a few designs done with this shape of card but I'm loving yours. The colours are perfect. You've inspired me to try this design (eek!). So cool, I loved the colors and I want to participate. This is fabulous, Barb! I can't believe that fits into an envelope. Such a fun idea! I have got to try one of these cards! Very cute. Just gorgeous! What a fabulous, fun way to showcase that sweet image! Love it! Oh Wow, this is an absolutely amazing masterpiece. I can't believe it folds up to go in an envelope. I am going to have look into this type of card. Congratulations on your 200th Challenge celebration and thank you for giving us the opportunity to win images along this blog hop journey. Wow! This is amazing! Love all the balloons and sweet cupcake! Hard to believe it actually fits inside the envelope! I just love this card. I just made my first box card and I can't wait to make another one. This is a great pop up card. I just made several of them - they are so fun! Wonderful balloons. This really is a very neat,festive card you've made. So cheerfull, it makes me happy!! I forgot to ask: is rhere anywhere a pattern from this boxcard?? Barbara I so love these box cards They need to be on my list to do next. Thanks for the lovely inspiration. Love this box of fun Barb! The balloons are perfect too. 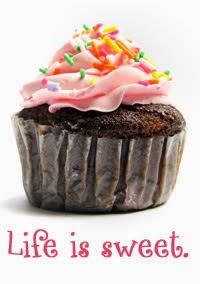 And who can resist a tasty or pretty cuppy? Love how you colored up the cupcake and added the festive balloons around it. Love, love this fun card Barb!! I love your awesome box - I think I need a Silhouette Cameo! I couldn't believe you then put it in an envelope - wowzers! 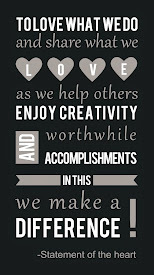 Thanks for the blog hop and the fabulous inspiration! Great card box!!! Love this project. Congrats on 200 challenges! OMG this is FABULOUS!!!! I LOVE every detail and how 'pops' out! This is a wonderful idea and card. I love it! Wow that's an awesome card! I will have to look up instructions on how to make it!! Fabulous creation and great detailing!! Great project. I love it. It's so bright and cheery. Wow, Barb...this is AMAZING! Love the colors. Bless you, your time, hard work and your amazing talent.I wish you many more creative years of inspiration!! 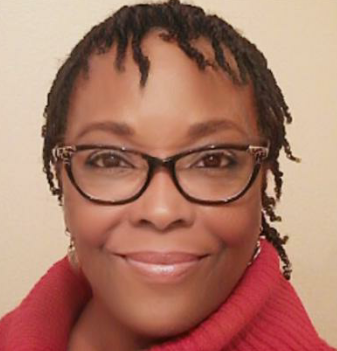 Keep up the fabulous work.Have a marvelous weekend.take care of yourself and stay warm. Beautiful card! I love these kinds of cards. Already told you, but I love this card!! It's so much fun and happy in a box, and I really love the colours!! Wow! This is so ciil! I love that it is quite unique in the shape, but all those balloons are amazing! What a great surprise it would be to open this up! Such a lovely card in the box - I just learned to make those this week =- you did a nice job - enjoy your week! Super creative!!! I've never seen anything like this - WOW!!! !